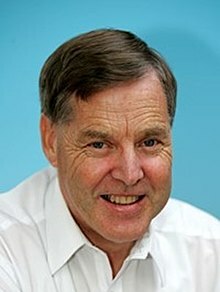 Martin Owen Gallagher JP (born 11 February 1952) is a New Zealand politician and was Labour member of Parliament representing the Hamilton West electorate until November 2008. Currently, he is councillor on the Hamilton City Council West Ward as well as Deputy Mayor of Hamilton. Gallagher was educated at Hamilton Boys' High School, and the University of Waikato where he completed a Bachelor of Social Science degree. He is a qualified teacher. He was first elected to Parliament in the 1993 election, when he won the Hamilton West electorate. In the 1996 election, however, he was defeated by National's Bob Simcock. In the 1999 election, he won back the electorate. At the 2005 election, he had a slender majority of 825 votes, 2.0% more than his opponent. In the 2008 general election he was defeated by National's Tim Macindoe. His list placing of 41 meant that he was not returned to Parliament. The swing in Hamilton West at the 2008 election against Gallagher was less than half the nationwide swing against his Government. Gallagher was Chairperson of the Foreign Affairs, Defence and Trade Select Committee and formerly the Law and Order Select Committee. Before standing for Parliament, Gallagher was a councillor for the Hamilton City Council from 1985–1994, and served as Deputy Mayor of Hamilton from 1988 to 1993, and again from 2016 to the present. After losing his Parliamentary seat in 2008, Gallagher returned to local body politics. In the 2010 and 2013 local elections, he ran for the Hamilton City Council and the Waikato District Health Board as an independent candidate. He was returned for both positions in each election. Gallagher has four children and is related to the well known Waikato family who run Gallagher Group, an international farming and security company. Gallagher is a Justice of the Peace. He returned to teaching after being ousted in the 2008 election. ^ * Temple, Philip (1994). Temple’s Guide to the 44th New Zealand Parliament. Dunedin: McIndoe Publishers. ISBN 0 86868 159 8. ^ a b c "Biography". Martin Gallagher. Retrieved 17 October 2013. ^ "Official Count Results – Hamilton West". electionresults.org.nz. Retrieved 17 October 2013. ^ "Martin Gallagher". Hamilton City Council. Archived from the original on 17 October 2013. Retrieved 17 October 2013. ^ Neems, Jeff. "Gallagher announces council, board bid". Waikato Times. Fairfax New Zealand. Archived from the original on 28 August 2010. Retrieved 28 August 2010. ^ "Martin Gallagher". Elections 2013. Retrieved 17 October 2013. ^ "Martin Gallagher". Elections 2010. Retrieved 17 October 2013. ^ Preston, Nikki (13 March 2010). "Wilson, Gallagher may stand". Waikato Times. Retrieved 14 April 2010. This page was last edited on 2 February 2019, at 16:58 (UTC).